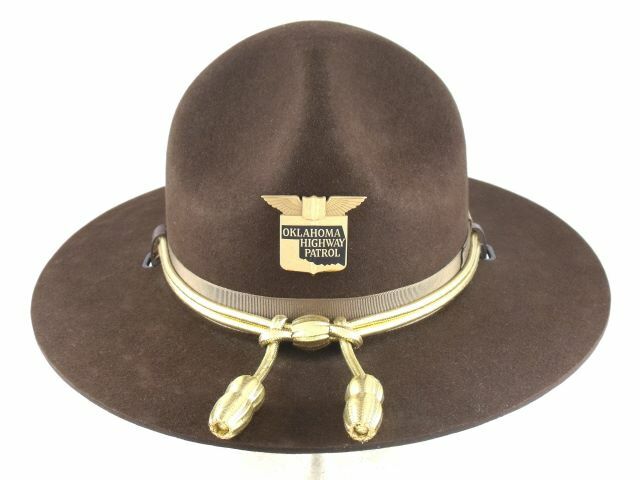 Oklahoma Highway Patrol Lt. Lance Schroyer was giving a woman at ride whom he found walking barefoot along the interstate when he came upon a vehicle that was severely damaged after crashing into the median. The crash scene was hard to see and there were no lights available to warn of the impending danger for oncoming vehicles. Thankfully, drivers were able to swerve and not cause additional accidents. The car’s front end, back end and both sides were crushed. The trooper blocked off traffic with his vehicle and told the woman in his vehicle to stay there as he went over to assess the situation. He thought the car may have been a case of a drunken driver who may have left the scene. However, as he approached the accident site, Schroyer heard a woman begging for help. “I just happened upon this,” Schroyer recalled later. The woman was face down with her head pinned between the end of the dashboard and the passenger door. Her body spread across the inside of the vehicle. It appeared, she hadn’t been wearing a seat belt. Schroyer tried to talk to the woman, who sounded like she was choking. There was blood everywhere. After calling for firefighters and paramedics, Schroyer got into the back seat of the car to try to keep her calm. With broken glass and wreckage strewn about and the woman pinned, Schroyer made a decision to move the woman for fear of the woman not living through the accident. He then moved the two-front seats backward and was able to get close enough to move her. “You never really want to move somebody in that situation, but at the same time, you’ve got to do what you’ve got to do to save lives,” he said. It looked like her head had hit the passenger’s side with so much force that the door had dislodged slightly. Lt. Schroyer was able to maneuver the door open and held her head trying to move her as little as possible to allow for better breathing. At one point, the woman was not responsive, and he feared the worst. Another trooper arrived, and both were able to get her into an upright position. The troopers stayed with her and did as much as possible to keep the woman calm until paramedics arrived on the scene. She was taken to the hospital. After returning to the office, Schroyer was called out to another traffic accident where two vehicles had crashed into one another. All four people involved were taken to the hospital, one in critical condition. He then went to the hospital to further his investigation into the accident. While there he checked on the woman whom he had helped earlier that evening. Lt. Schroyer was told that if not for him, she most likely would have succumbed to her injuries. The woman’s husband was with her, and he was told she would be OK and that her vehicle accident was most likely caused by a medical condition. “It was just kind of fate that I was there,” he said. 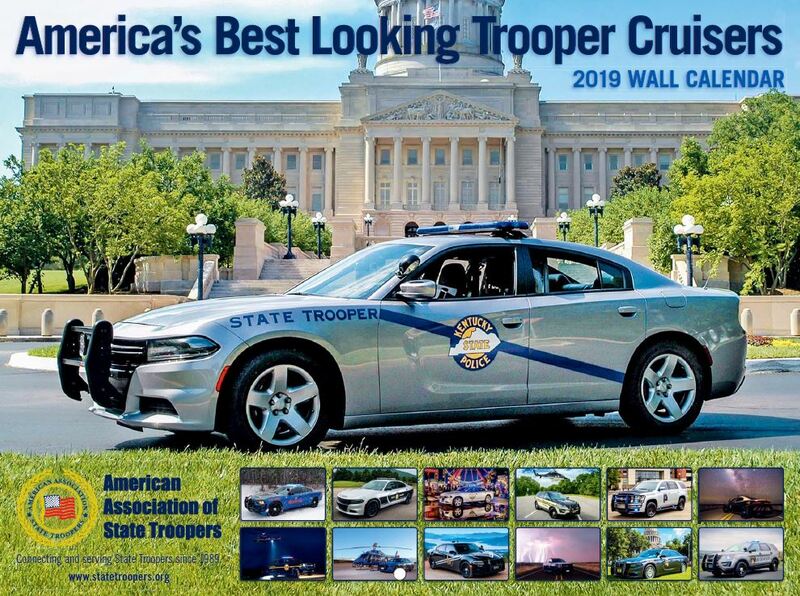 The Best Looking Trooper Cruisers 2016 Calendar is available for pre-order! 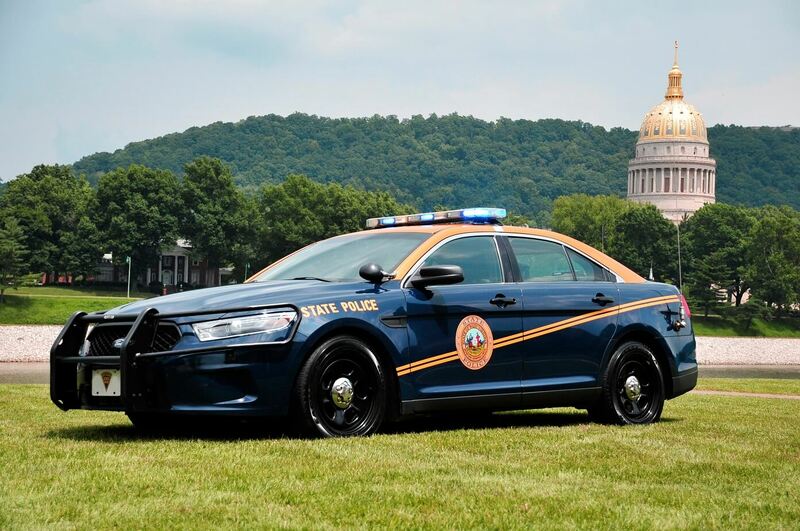 Congratulations to West Virginia State Police, winner of the 2015 Best Looking Cruiser Contest! A Massachusetts State Trooper was recognized Tuesday at the Statehouse for his actions during a dangerous daytime shooting incident on Brockton in March 2014. Trooper Shaun P. Bellao was among 12 police officers from six departments honored by Gov. Charlie Baker. The dozen officers received Hanna Awards for exemplary acts of bravery while carrying out their duties in the last years. “The officers we honor today responded at a moment’s notice and put everything on the line in order to keep the public safe from danger,” said Gov. Baker, who presented the awards in the Massachusetts House Chamber. “They are a testament to the level of excellence we expect from law enforcement and their actions show what all officers stand ready to do if the situation demands it.” The George L. Hanna Awards for Bravery are named in memory of State Trooper George L. Hanna, who was shot and killed in the line of duty during a traffic stop in Auburn February 26, 1983. 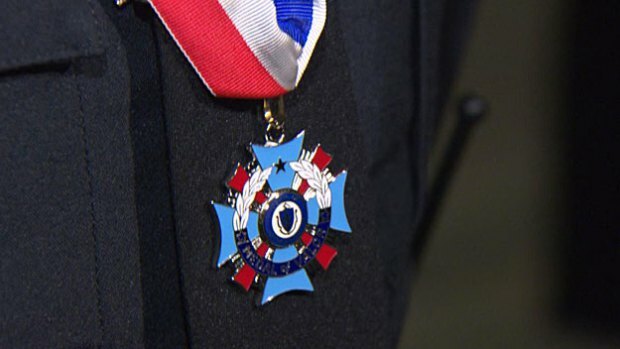 The Medal of Valor Trooper Bellao received is the second highest Hanna award and is awarded to officers who demonstrate actions above and beyond the call of duty, disregarding the potential for danger to themselves. 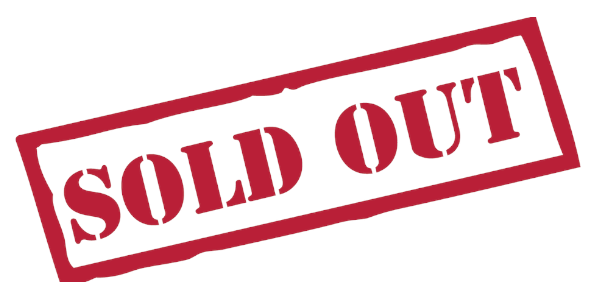 According to a State Police summary of the events, Thursday afternoon, March 20, 2014, Trooper Bellao was participating in a joint operation with members of the Brockton Police and two other State Troopers. The troopers heard two gunshots and observed two males, who were later identified as the shooting victims, running away. The troopers immediately drove toward the origin of the shots fired. As they approached the area, they heard two additional gunshots. Two other males were seen running up the street, one who had a silver handgun in his right hand. The troopers drove toward the two males, who continued to run. When the two suspects, one still clearly displaying the firearm, began to run in the opposite direction, the troopers immediately stopped, exited their vehicle and identified themselves. When the suspects did not stop, the troopers began to chase them. As the suspects approached a backyard, they split up and one suspect was immediately apprehended while Trooper Bellao continued to chase the second, armed suspect, according to the summary. The suspect climbed over a chain-link fence and, as he landed, he swung the firearm around and pointed the handgun directly at Trooper Bellao who, continued to pursue the suspect. The suspect then ran into a fenced backyard and attempted to climb a fence when Trooper Bellao caught him. After a physical struggle, Trooper Bellao was able to wrestle the handgun from the suspect and place him into custody. 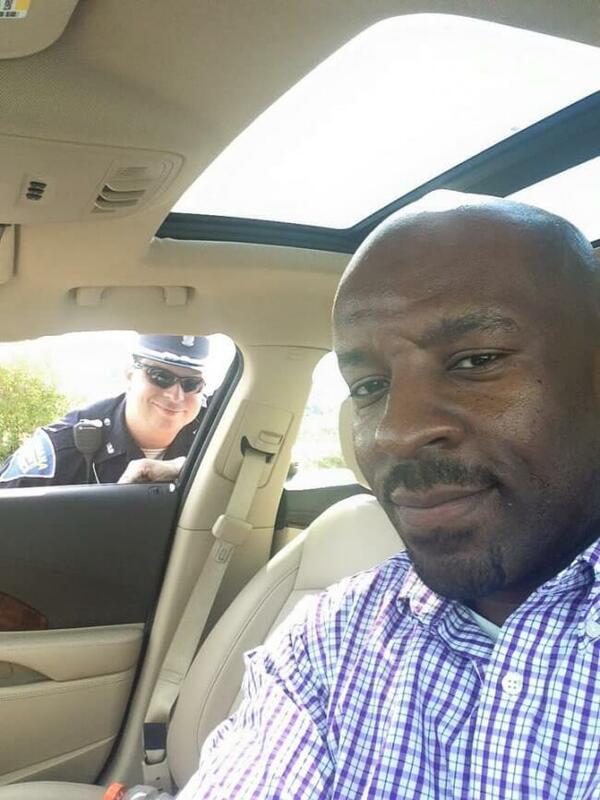 `Courtesy ofThe Enterprise News,Boston,Massachusetts, Gatehouse Media Inc.
As he passed the trooper and the ominous flashing lights turned on, Greg Barnes pulled over, "Immediately I knew I was in the wrong.” After being handed a warning from the Indiana trooper, Barnes asked to take a selfie with Tpr. Cosgrove to send a message. ELIZABETHTOWN, Ky. (WDRB) - It's a picture that has gone viral - a little girl posing with state troopers from Kentucky and Ohio while holding one of their hats in her hands. The picture was taken by Sarah Yockey of Elizabethtown on Friday evening following the funeral of slain Kentucky State Police trooper Joseph Cameron Ponder. Senior Trooper Nic Cederberg, a 7-year veteran of the Oregon State Police, was named the American Association of State Troopers 2017 Trooper of the Year for his heroic efforts to stop a murderer from taking more lives. On December 25, 2016, at approximately 10:30 p.m., a male suspect met his estranged wife, Kate Armand, at his mother's residence in King City, OR to exchange their eleven month old daughter for visitation. After carrying their daughter into his mother's house, the suspect returned to Kate's vehicle and shot her eight times, killing her as she attempted to escape. Trooper Cederberg was taking a Christmas evening break with his family at his residence. He monitored the ATL on the suspect’s movements and having grown up in the area he knew the suspect would have to go one of two directions to avoid police detection. As Trooper Cederberg patrolled towards King City he found the suspect’s car backed into a driveway. Trooper Cederberg was in an unmarked patrol car, the suspect drove off and a pursuit ensued. During the chase the suspect shot at Trooper Cederberg’s vehicle repeatedly. While under fire, Trooper Cederberg continuously radioed position update to other responding officers in an effort to expedite their response. The suspect eventually turned down a dead end road. Trooper Cederberg stopped his patrol car short of the end of the road to set up for the suspect’s return. He watched as the suspect did a U-turn and accelerated toward him, and although responding officers were still several minutes away, Trooper Cederberg knew the suspect needed to be stopped. It was clear the suspect intended to ram Trooper Cederberg’s patrol car so the trooper began firing to stop the threat. After ramming Trooper Cederberg’s patrol car the suspect immediately started shooting at the trooper through his passenger window, striking Trooper Cederberg in the right hip knocking him to the ground. The gunshot rendered Trooper Cederberg’s legs useless and it is believed that this is the bullet that is still currently lodged against his spine. Although wounded in the exchange, the suspect got out of his car and moved around the back of his vehicle looking for the trooper. Unable to get up, Trooper Cederberg was able to reload and return fire as the gunfight continued. The trooper attempted a second reload as suspect charged him firing indiscriminately, his last shot fired a few feet from Trooper Cederberg. The trooper continued to move and fight on the ground; he was struck a total of eleven more times. Five rounds were absorbed by his ballistic vest, but seven rounds struck his body. The suspect disengaged from the gunfight when he heard the sound of approaching sirens and ran into a nearby wooded area to set up an ambush. The suspect’s ambush was unsuccessful, he died at the scene after a brief but intense exchange of gunfire with other officers. Officers began treating Trooper Cederberg’s injuries immediately, he was taken to the hospital where he endured numerous surgeries and a lengthy stay in the ICU. His injuries include a collapsed lung, two broken arms, and a bullet lodged against his spine. The bullet near his spine is too dangerous to remove and could be a part of him for the rest of his life. Trooper Cederberg is still recovering and requiring intense medical treatment. He continues his fight to get better and return to a normal life. Trooper Cederberg has kept an amazing and optimistic attitude. He’s told his friends and family, “I was just doing my job”, his actions helped stop a crazed murderer from injuring or killing more innocent people. Cederberg was presented the award on July 12, 2017, at a meeting of the Superintendent’s executive staff in Salem, Oregon. Capt. 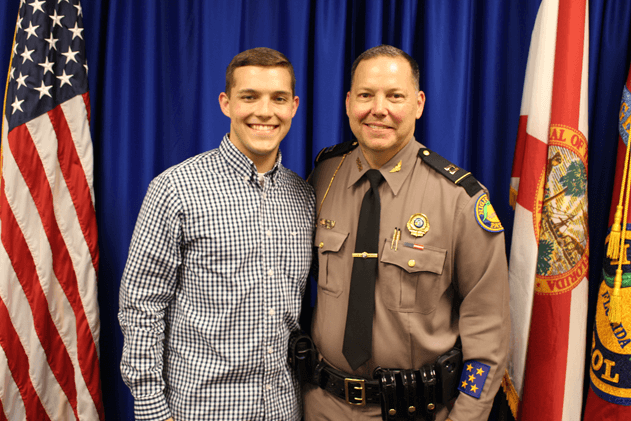 John Bagnardi, Florida Highway Patrol, chairman of the Trooper of the Year committee, Lt. Colonel Dave Witt (ret) who began with the Oregon State Police in the 1950’s and Jason Bledsoe, Oregon State Police, AAST Oregon State Director all attended on behalf of AAST for the presentation of the award to Trooper Cederberg. 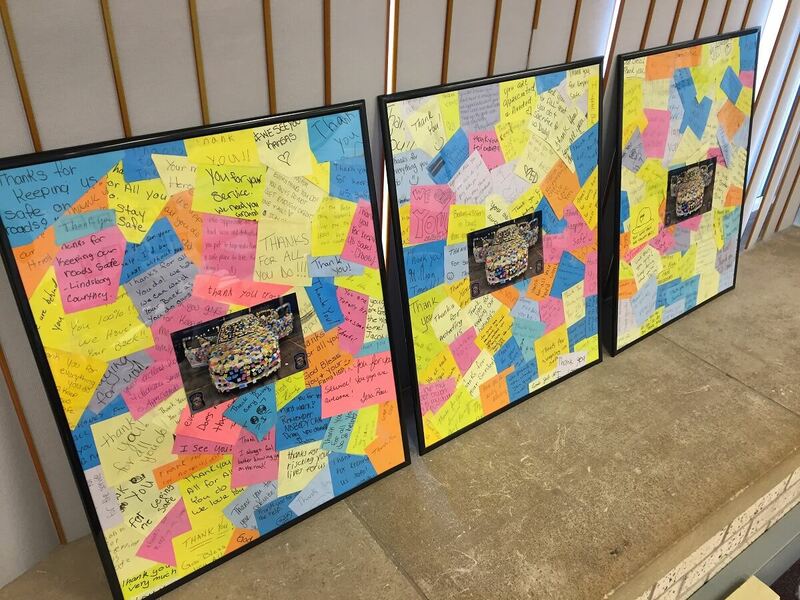 Men and women, girls and boys, people of all ages came to the booth to deliver their messages of support.The Patrol acknowledges so many acts of kindness to our personnel over the last few weeks, and we say a humble thank you for your kindness, acknowledgment, and support.The kind words left on the notes were not taken for granted, and left such a positive impact that each and every note was saved.